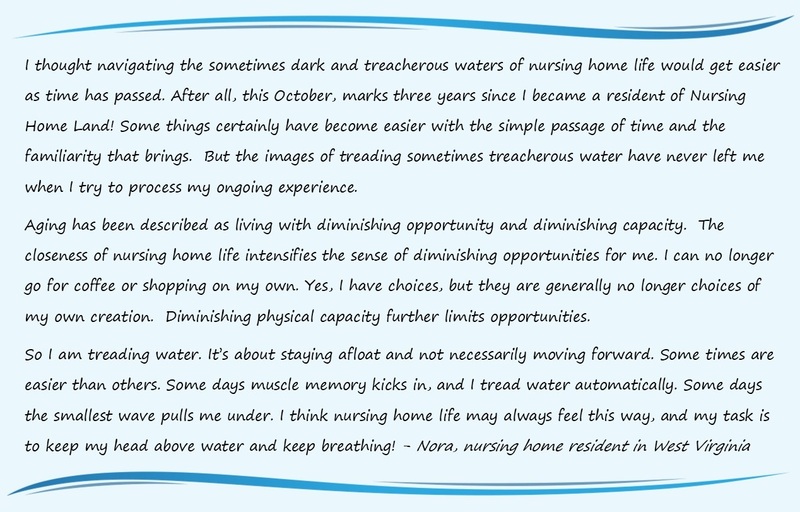 Consumer Voice’s advocacy continues so that residents can do more than just stay afloat, and instead live life to their fullest, as envisioned by the Nursing Home Reform Act. It’s because of residents like Nora that Consumer Voice fights for policies and standards that promote person-centered, individualized care; why we work to educate and empower residents to direct their care and lives; and why we work to equip ombudsmen and other advocates to support and empower residents to achieve their highest potential. We need your support! Your donation provides the unrestricted resources we need for our advocacy! With your support Consumer Voice will continue to show up and STAND FOR QUALITY for your family member, your friend, your neighbor, and, should the time come, for YOU, so all can do more than just “tread water” in long-term care. Donate today! Every amount helps! Honor that person who needed, or still needs, long-term care. With your donation, tell us about your friend, family member, or other person who is inspiring your contribution. We will list their names on our tribute page on our website. Send in your donation via mail or online. Join our President’s Circle – individuals who commit to donating $1000 or more in a calendar year. Sign up for a monthly donation and support our activities year-round! Any amount can be set for a recurring donation - $10, $25, $50, or more! And just $85 per month qualifies you for the President’s Circle! Give a gift of stock. Transferring your stock or mutual fund to Consumer Voice is a simple and tax-efficient way to make a contribution. Earmark your mandatory 401K distributions to Consumer Voice – which also reduces your tax liability. See our Contributions Page for other suggestions. Consumer Voice needs YOU to support our work advocating for quality long-term care! Please join us in Standing for Quality!